In hospitals, urgent care, long-term care and other healthcare facilities, immobile patients make complete evacuation in the case of a fire difficult or impossible. For this reason, containing fire through built-in or passive fire protection in tandem with active fire protection measures is crucial in health care occupancies. 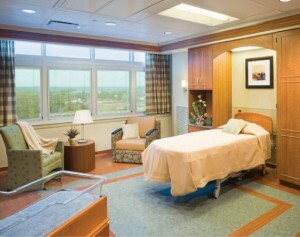 In addition, research shows that adding natural light in healthcare interiors leads to healthier outcomes. Today’s clear fire rated glazing products play a key role in providing patients both fire safety and light in new and renovated healthcare facilities. Clear glazing in healthcare occupancies is healthy for patients and workers. 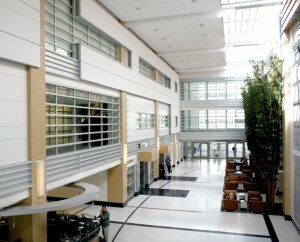 In 2006, The Center for Health Design published a report finding that: “By controlling the body’s circadian system, light impacts outcomes in healthcare settings by reducing depression among patients, decreasing length of stay in hospitals, improving sleep and circadian rhythm, lessening agitation among dementia patients, easing pain, and improving adjustment to night-shift work among staff.” The study concluded that “adequate and appropriate exposure to light is critical for health and well-being of patients” and staff in healthcare settings. Natural light is not only healthy, it’s green because it reduces the need for artificial light and energy use. On a normal day, hospitals and healthcare facilities are abuzz with moving people and equipment. Imagine the added chaos during a fire. 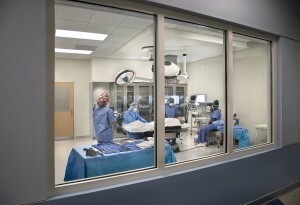 With all this activity, it is surprising to still find ubiquitous, unsafe wired glass in hazardous locations throughout today’s healthcare occupancies. According to the Capital Funding Buzz Survey conducted in November 2012, 47% of the responding hospitals and healthcare providers prioritize capital investment in upgrading existing facilities in the next 12-18 months. When renovating, healthcare executives and designers should give serious thought to replacing unsafe wired glass because it is incredibly fragile, breaks easily on impact and is likely to injury anyone who runs into or through it. Decades ago, unsafe wired glass was the only fire rated glass product available. Fortunately, today’s fire rated glass options include low-cost, clear glazing products that outperform traditional wired glass in both fire and impact safety. 1-hour exit corridors – 20 min. door vision panels and 45 min. sidelites, transoms and openings. If the glazed area exceeds 25% of the wall area, 60 min. fire resistive glazing must be used. 1-hour exit/stairwell enclosures -60 min. door vision panel and 60 min. sidelites, transoms and other openings. 60 min. 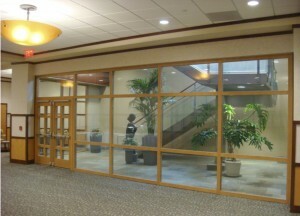 fire protective glazing can be used in the door vision panel up to 100 sq. in. To exceed 100 sq. in. in door vision panels, 60 min. fire resistive glazing is used. 60 min. fire resistive glazing must be used in the sidelites, transoms and openings. 2-hour exit/stairwell enclosures – 90 min door vision panel and 120 min sidelites, transoms and other openings. 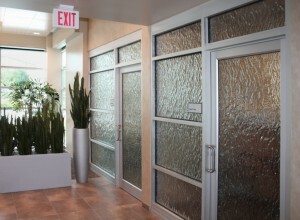 90 min fire protective glazing can be used in the door vision panel up to 100 sq. in. To exceed 100 sq. in, 90 min fire resistive glazing is used. 120 min fire resistive glazing must be used in the sidelites, transoms and openings. 1-hour exterior walls (when permitted per Table 705.8 in the IBC) – 45 min fire protective openings within specified limits. To exceed specified limits, 60 min. fire resistive glazing must be used. 2-hour exterior walls (when permitted per Table 705.8 in the IBC) – 90 min fire protective openings within specified limits. To exceed specified limits, 120 min. fire resistive glazing must be used. “Total building fire protection for life safety is more necessary in healthcare occupancies than other occupancies, because of the nature of the occupants,” says NFPA Technical Committee member Daniel O’Connor. System Planning Corporation evaluated data from the National Fire Incident Reporting System to determine the relative role of built-in or passive protection, which refers to the use of fire resistance construction in doors, openings and walls to prevent or slow the spread of fire from the room of fire origin to other building spaces. By limiting the spread of fire with fire resistance materials, damage to the building is reduced and building occupants gain time for emergency evacuation or movement to areas of refuge. The report found that built-in fire protection limited fire spread to the room of origin in 90% of health-related buildings. 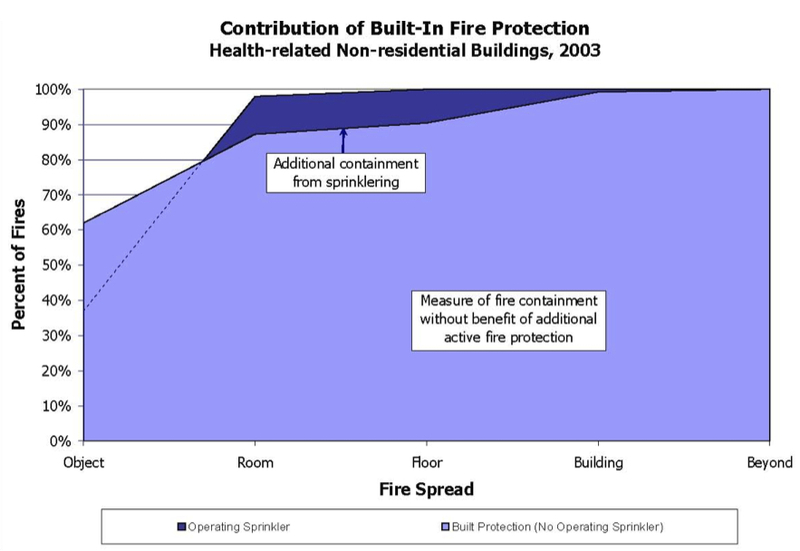 Active fire suppression systems, such as sprinklers, and speedy fire department response provided the other 10%, meaning that built-in or passive fire protection does the majority of the work. Architects who renovated an existing 69,000 sf health education facility at Central Carolina Technical College used SuperLite II XL-60 in lab walls to create vision, transparency and fire safety. 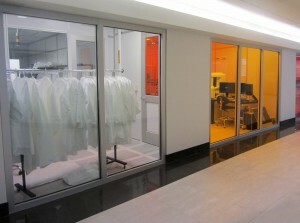 In addition to the labs, fire rated assemblies encompass computer labs, student lounge and student library, giving the building an open, airy feeling while still meeting building code requirements. Read more…. 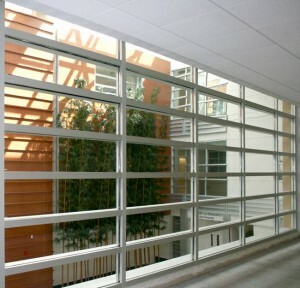 Central to designing the new University of California Davis Medical Center was the installation of 20,000 sf of fire rated glass to allow natural light to enter vertically through the atrium and light wells and horizontally into the adjacent hallways, rooms and interior spaces. Read more…. 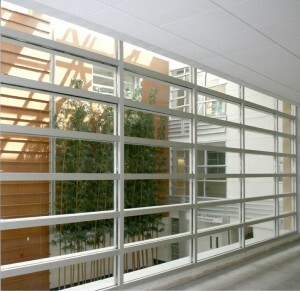 To see other healthcare occupancy installations of fire rated glass for fire protection and natural light benefits, click here. The pdf shows fire rated glass and framing installations in Baylor Orthopedic Spine Hospital, Kaiser Permanente offices, Reid Hospital, University of Wisconsin Hospital and others.